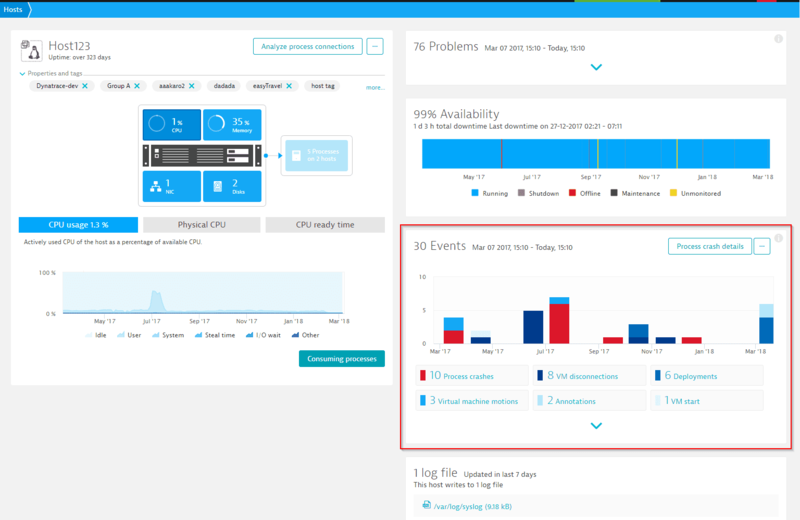 Events are essential raw data that Dynatrace AI considers during automated root-cause analysis to understand the reasons underlying any problems that are detected in your environment. 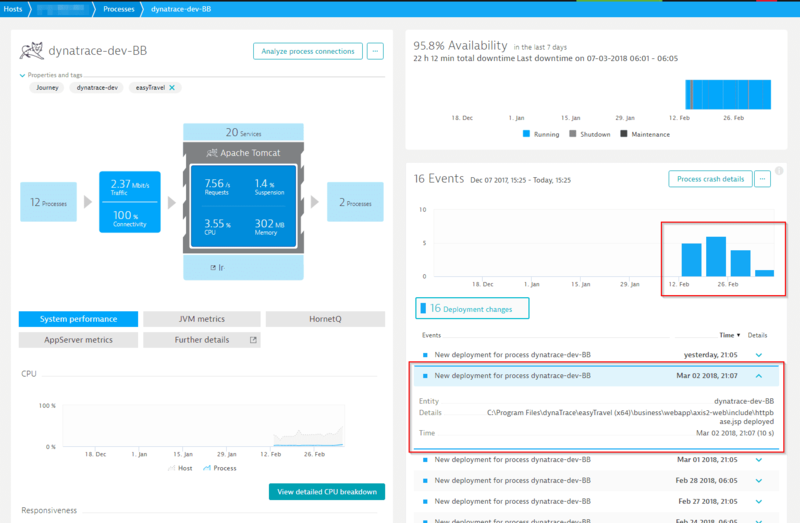 Out-of-the-box, Dynatrace detects more than 80 different built-in system event types, including process crashes, deployment configuration changes, and VM motion events. Using extension points, you can report custom events through OneAgent plugins or via the Dynatrace API. 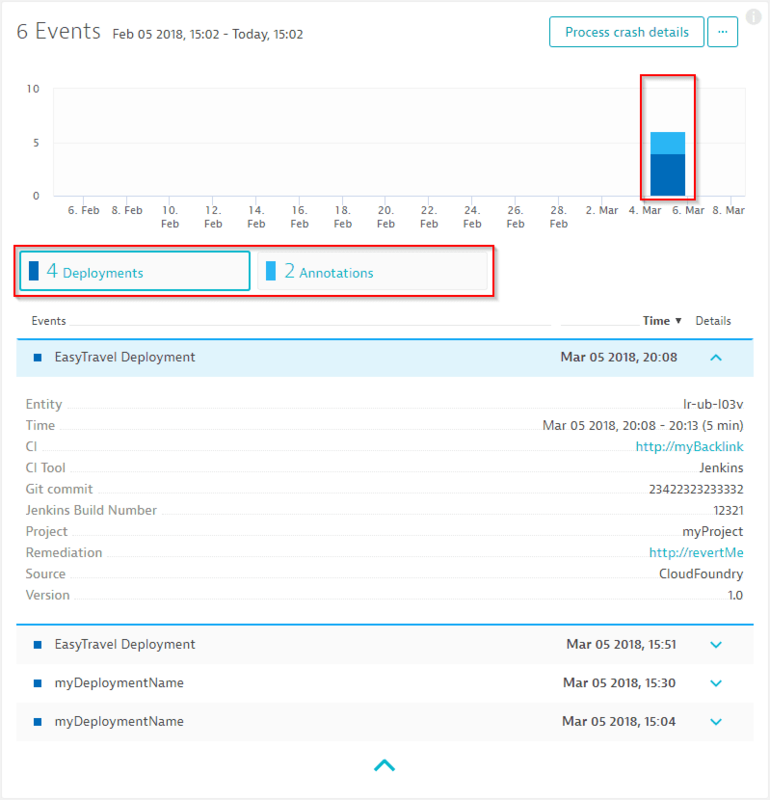 The Events section on each host, process, and service overview page provides a chart that displays overall statistics for each event type that occurred during the selected analysis timeframe. Within production environments, a single host, or even a single process, may include thousands of individual events. The Dynatrace event-analytics engine can process all such events, even over large analysis timeframes. Importantly, event analysis offers convenient drill-down and filtering options that make it easy to focus on specific points in time where high event activity occurred and then filter those events based on event type. The Events chart in the example below shows multiple event types over the course of a year-long analysis timeframe. However, the example below focuses on a single point in time and a specific event type. By drilling down into the event highlighted below, we see that the file ase.jsp was newly deployed at this point in time.